Even the positive Factory Orders in Germany could not support EUR against the strong USD. 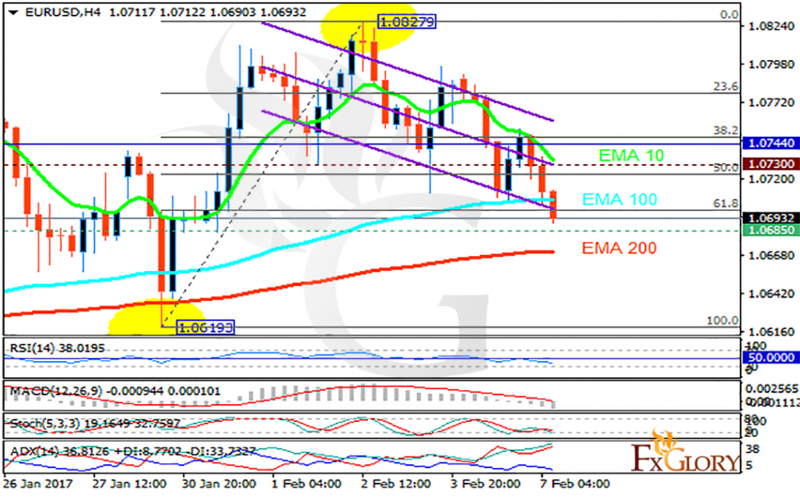 The support rests at 1.06850 with resistance at 1.07300 which both lines are below the weekly pivot point at 1.07440. The EMA of 10 is moving with bearish bias along the descendant channel but it is above the EMA of 100 and 200. The RSI is falling towards the oversold area, the Stochastic is showing downward momentum and the MACD indicator is in neutral territory. The ADX is showing a buy signal. The support level breakthrough will be a good opportunity for buyers to make profit by the price growth when it has already passed the 61.8 level of Fibonacci retracement.